the publication history of the work reveals the extent to which Swift lost control of the production over the Travels: the first edition of the Travels was heavily and illicitly doctored by its printer. Gulliver's Travels began life not as the work of a single man, but as a group project. The idea originated with the Scriblerus Club, a group including Swift, John Gay, Alexander Pope and John Arbuthno. The Scriblerus Club was a group of writers and wits devoted to satirising what they perceived as the folly of modern scholarship and science. They invented an author and pedant called Martinus Scriblerus, and wrote an imaginary biography of him, which was finally published in 1741, as The Memoirs of Martinus Scriblerus. However, parts of the memoirs were written in the early years of the 1720s, and Pope says that Gulliver's Travels was formed from a hint in the memoirs. If you actually read the memoirs as they appeared in 1741, you'll see that chapter 16 describing the travels of Martinus bears a close resemblance to the travels of Gulliver. If the Travels were initially generated by the Scriblerians interest in mocking pedantry and contemporary science, it was Swift alone who fleshed out the narrative of a Scriblerus character sent off on a series of imaginary journeys. From Swift's correspondence, we know that the main composition of Gulliver began around the end of 1720, and was finished in the autumn of 1725. It was not a good time for Swift. While writing A Tale of a Tub, Swift thought he could realise his ambitions for a rise within the church, and the Tory leaders with which he had aligned himself were in the ascendancy. By the time he started work on Gulliver's Travels things looked bleaker. He had failed to obtain any Church preferment in England, and he had been forced instead to accept a lowly deanery in Ireland. The Tory government had fallen, and his friends and allies impeached by the Whigs. Gulliver's Travels was in part a virulent attack on the Whig ministry that Swift blamed for these circumstances. Swift saw the book as politically explosive, and therefore as something that he had to present and position quite carefully in order to avoid prosecution. He secretly sent the manuscript to a publisher, Benjamin Motte. Accompanying the manuscript was a letter asking Motte if he would publish Gulliver's Travels signed by Gulliver's imaginary cousin, Richard Sympson. Sympson is the author of the prefatory letter to Gulliver's Travels. So already there is a distinct blurring of the boundaries between fact and fiction: in his real life dealings with his publisher, Swift hides behind a fictional figure that later appears within the work itself. Motte was keen to publish Gulliver's Travels, and it came out in October 1726, very quickly – in fact, so quickly that Swift was unable to correct proof copies of his work before it appeared in print. When it did appear, he discovered to his horror that not only was it full of misprints, but also that Motte had deliberately altered the text of several passages, cutting out or toning down the sections he thought were too dangerously outspoken. Swift was outraged at this invasion of his authorial rights. While many of the misprints were corrected in the next edition, it was not until 1735, that Motte's heavy editing of Gulliver's Travels was removed, then it appeared in Dublin publisher George Faulkner's multi-volume edition of Swift's works. Despite Swift's fury, Motte's 1726 edition of Guliver's Travels was a huge success. The first impression sold out within a week. Within three weeks, ten thousand copies had been sold. Gulliver's Travels was the talk of the town. Swift's correspondence from the time is jubilant about its success, but also makes joking references to the fact that he didn't write it. So here already we have a rather strange set of relationships established between Swift and the authorship of Gulliver's Travels. First the book starts out as the product of several minds, a group project. Then it becomes Swift's own, but one from which he distances himself by pretending that its really by its fictional narrator, Gulliver, and brought to the publisher by Gulliver's fictional cousin, Sympson. Then the book is published, and rather than getting Swift’s own version of Gulliver's Travels, the London literati get a version bowdlerised by the publisher. Nonetheless, it is a hit, and Swift revels in the success of 'his' book; yet he continues to pretend that it's not 'really' by him. By 1726, the notion of authorship of Gulliver's Travels is a tricky business. 'If the Censure of Yahoos could any Way affect me, I should have great reason to complain, that some of them are so bold as to think my Book of Travels a meer Fiction out of Mine own Brain'. 'There is an Air of Truth apparent through the whole; and indeed the Author was so distinguished for his Veracity, that it became a Sort of Proverb among his Neighbours as Redriff, that when any one affirmed a Thing, to say, it was as True as if Mr Gulliver had spoke it'. 'But if I should describe the Kitchen-grate, the prodigious Pots and Kettles, the Joints of Meat turning on the Spits, with many other Particulars; perhaps I should be hardly believed; at least a severe Critick would be apt to think I enlarged a little, as Travellers are often suspected to do…'. 'The following little History (which I can affirm for Truth, having it from the Mouths of those chiefly concerned in it) is a sad Example of what Miseries may Attend a Woman'. As those of you who have read either Moll Flanders or The British Recluse will know, there isn't anything all that plausible or realistic about the events that occur in these 'true' fictions. The emphasis on authenticity comes hand in hand with a heavy dose of sensationalism. In a highly competitive book market, this sensationalism became ever and ever more outlandish, as authors struggled to surpass one another in novelty and singularity. 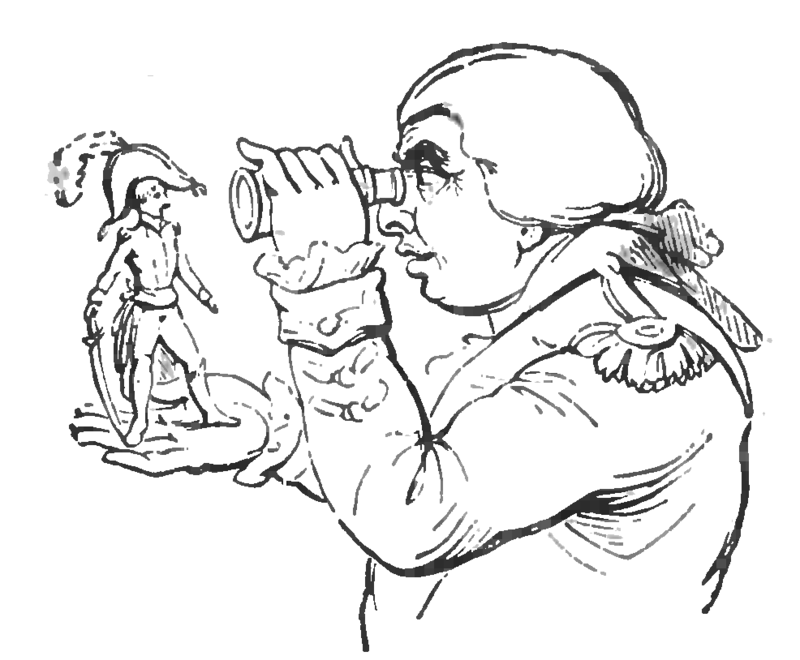 In some ways, Gulliver's Travels satirises the competing commitment to sensationalism and truth claims that characterised contemporary successful prose fiction. It stretches the plausibility of the 'life and surprising adventures' genre to its limit, by attempting to pass off as private history an account that is palpably fantastical. But the emergent novel wasn't the only genre marked by these defences of authenticity. They are also found in contemporary travel writing. Swift's use of the name Sympson in his negotiations with his publisher, and his creation of this Sympson as a fictional cousin of Gulliver's, links him to Captain William Sympson, the equally fictitious author of A New Voyage to the East Indies (1715). A New Voyage asserted in bold terms the autobiographical nature of its account, but was in fact plagiarized from an earlier travel book. 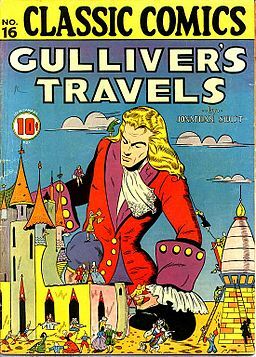 Gulliver's Travels derived much of its popularity from the contemporary readers' enthusiastic consumption of travel compilations and the records of journeys and voyages. Swift himself owned a number of accounts by famous travel writers, including the sixteenth century such as travel writers Richard Hakluyt, Samuel Purchas, and William Dampier. There is a sustained imitation of various travel accounts in Gulliver's Travels: the description of the storm in Book II closely copies the style of a seventeenth narrative called Mariners Magazine by Captain Samuel Sturmy. Swift places the locations of his fictitious voyages in regions visited by one of the most famous travel writers of the period: the pirate, explorer and author William Dampier. Dampier produced an account of his 1699 expedition to Australia, then known as New Holland, which had appeared as a two part account called A Voyage to New Holland published in 1702, and A Continuation of a Voyage to New Holland published in 1709. Lilliput is supposed to be between Van Dieman's land, which was Tasmania, and the northern coast of Australia. The land of the Houyhnhnms in Book 4 is just south west of Australia. Gulliver's Travels also exploits some of the potential for absurdity that was evident in travel accounts. 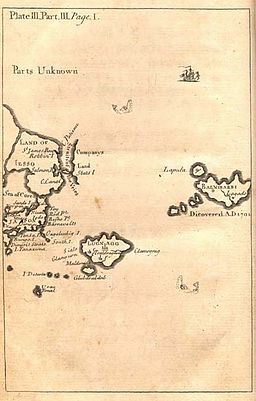 In contemporary travelogues, one way in which authors attempted to emphasize the authenticity of their account was by representing islands in woodcuts as they would appear if they were seen through a telescope. Having no sea shown on them, and cut off at the base, they in fact look as if they’re flying through the air. When Laputa flies over Balnibarbi, Swift literalizes the comic potential of the travel narrative and its illustrative apparatus. Another important aspect of the travel narrative satirised by Gulliver's Travels is its function as a form of reflection on contemporary European society. Travelogue's observations about new nations and experiences could be used to interrogate domestic culture and mores, not always to their advantage. And this aspect of the growing interest in the new world that wasn't just confined to travel-writing. Contemporaries were fascinated by the possibility that a savage could be noble, revealing by contrast the corruption of a 'civilised' voyager (Consider Aphra Behn's Oroonoko). Gulliver's progressive disillusionment with his own society, and his preference for the civilised world of the Hounymnyms in the final book, represents this contemporary vogue taken to an extreme: by the end of the fourth book, Gulliver returns to England and can only tolerate the company of horses, and he stuffs his nose with lavender and rue to cut out the smell of mankind. And as a story, Gulliver's Travels both capitalises on the commercial vogue for travel writing, and shares some of the excitement of a real travellers tale. We aren't just distanced readers enjoying the irony of the satire – one of the things that has made the Travels into a children's classic is that on a basic level of plot and story, we want to know what Gulliver finds, and what happens next. But the Travels are also a parody. And Gulliver is a splendid liar, masquerading as a purveyor of genuine experiences. Swift draws on the rhetoric of veracity to undercut the truth claims found in contemporary prose and prose fiction. The irony of this satire is that underwriting Gulliver's Travels is the implicit assumption that this fictional world can in fact tell us the truth about the 'real' world of contemporary English society and politics, for the narrative works as a form of allegory. Swift draws on a tradition developed through Thomas More's Utopia, and the satiric narratives of Rabelais and Cyrano de Bergerac: the tradition of describing fantastic countries that satirise contemporary clerics, politicians, and academics. Like all allegories, these mock-traveller's tales gesture towards the true state of things by telling a lie, or in the Hounynyms' phrase, 'telling the thing that is not'. So Gulliver's Travels is a fictional tale masquerading as a true story, yet the very fictionality of the account enables Swift author to reveal what it would not be possible to articulate through a genuine account of the nation. Allegory provides an interpretative framework within which a 'true' set of values or ideas can be communicated, as one narrative gestures toward another which is not directly perceivable or communicable. Allegory does this via a series of equations or equivalences. For example, in A Tale of a Tub, Martin equals Anglicanism, Peter equals Catholicism, and their quarrel equates to the Reformation. The trouble with Gulliver's Travels is that the allegory does not remain constant: the frame of reference shifts, making it hard to decipher the ultimate reality toward which it points. For example, it is never entirely clear for who or what the figure of Gulliver stands. 'I would not have dwelt so long upon a Circumstance, that perhaps at first sight may appear not very Momentous; if I had not thought it necessary to justify my Character in Point of Cleanliness to the World, which I am told, some of my Maligners have been pleased on this and other Occasions, to call in Question'. This clearly seems to operate as a reference to previous attacks on Swift, whose writings, especially A Tale of a Tub, had been attacked as filthy, lewd, and immodest. Gulliver's self defence operates as Swift's own self defence in the face of existing criticisms of his work. 'Having in my Life perused many State-Tryals, which I ever observed to terminate as the Judges thought fit to direct; I durst not rely on so dangerous a Decision, in so ciritical a Juncture, and against such Powerful Enemies'. Here Swift, via Gulliver, offers a defence of Bolingbroke's decision not to stand trial over his part in the Jacobite Atterbury plot of April 1722. We read, in this context, Gulliver's reasoning as an allegorical figuration of Bolingbroke's part in recent political history. But can allegory function in this way? Gulliver's Travels invites interpretation as an allegory, but the allegorical framework is constantly shifting, making it hard to pin down exactly to what version of 'reality' the fiction relates. Who is Gulliver? Is he Swift? Bolingbroke? Locke? Dampier? Ever since the book was first published, readers have tried to 'fix' an interpretative system for decoding the topical satirical focus for the Travels. Just two weeks after Gulliver's Travels came out, newspapers were advertising A Key, Being Obervations and Explanatory Notes, upon the Travels of Lemuel Gulliver (1726), which offered all the necessary identifications for unpicking Swift's satire. Some of these offered genuinely relevant readings of individual figures (for example, Flimnap as Walpole), but in attempting to offer a systematic explanation of the whole book in terms of topical comment, it revealed just how hard it is to tie much of the Travels down. 'I was an Hour walking to the end of this Field; which was fenced in with a Hedge of at least one hundred and twenty Foot high, and the Trees so lofty that I could make no Computation of their Altitude'. 'My Wife ran out to embrace me, but I stooped lower than her Knees, thinking she could otherwise never be able to reach my mouth'. '…Men, barely by the use of their natural faculties, may attain to all the knowledge they have, without the help of any innate impressions, and may arrive at certainty without any such original notions or principles'. At the core of Locke's philosophy is the argument in which Locke describes the mind at birth as a tabula rasa – a wax tablet as yet unmarked by the impressions that experience will write on it. Experience is something that the mind cannot refuse, and at a basic level, the mind is marked by the initial sensation of the object perceived. From those markings, we use sense and reason to build up a system of knowledge. What we know then, is derived from connections made between perceived experiences – not from any innate wisdom or understanding. Locke's theory provoked a debate about what was real. His idea of the materialism of objects external to the body seemed opposed to any sense of inner reality. 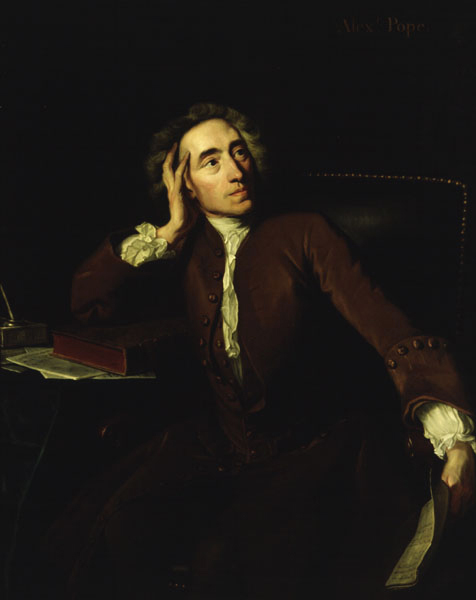 In Locke's philosophy of knowledge, reason is elevated above spiritual revelation. For a staunch Anglican like Swift, it seemed to offer a defence or intellectual basis for deism, or atheism. 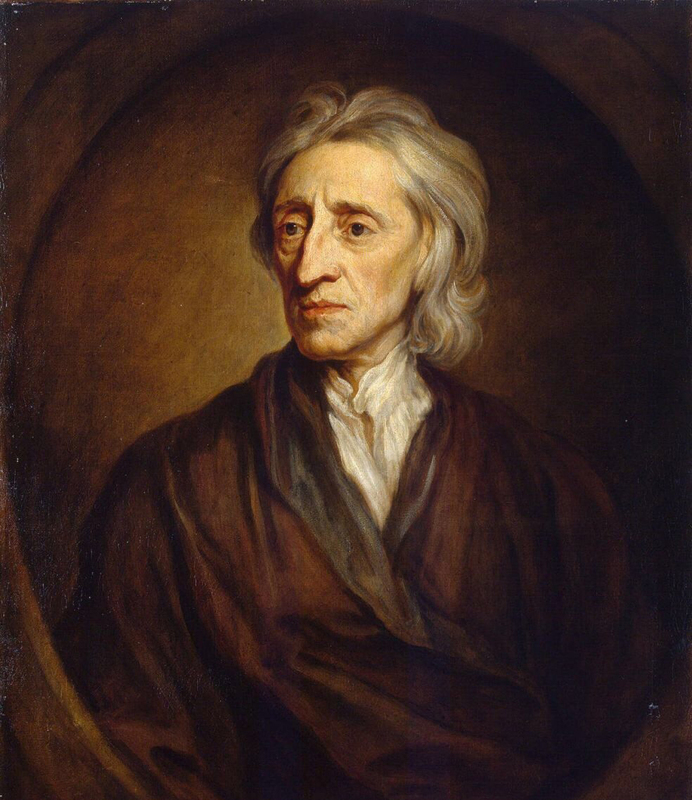 Although Locke's Essay was initially intended to provide an investigation of the nature of religious belief, many Anglicans thought Locke was creating an epistemology that cut God out of the equation. We could read Gulliver's troubles in understanding what he sees as a parody of Locke’s philosophy of human understanding. Gulliver looks to the material world around him to gain a sense of knowledge. There is a great deal of emphasis on what he sees, and a real striving to attain some kind of objectivity, to record his impressions accurately. However, his impressions and his sensory apprehension of those worlds do not help him to gain knowledge. He looks at the trees around him to get a sense of scale, but they do not help. One of the central parts of Lockeian philosophy was that knowledge was not purely derived from sense data, but that man used reason to work out the connections between the ideas received through experience. However, although Gulliver tries to measure one object against another to establish a correct perspective, he remains unable to establish a secure view of the world. In a broader sense, Gulliver should be able to calibrate moral behaviour by using his external experiences of the people that he meets on his travels as a body of knowledge from which he can derive a sense of an ideal society. 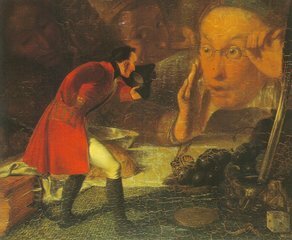 In terms of Lockean empiricism, it is significant that Gulliver has no inbuilt, preformed sense of spiritual or inner revelation. All he has is what he sees, and he uses that to define his own moral philosophy. But the philosophy he arrives at by the end of the book is one which is profoundly misanthropic and patently ridiculous: when he returns home after his voyage to the Hounynyms, he has concluded that he wants to live with horses, and make canoes out of humans. Swift offers us a mind which has indeed been imprinted with what it experiences from the senses, but which is unable to configure these experiences into a useful and meaningful worldview. The ultimate result of all Gulliver's experiences is a profound disorientation: because he has no innate sense of himself and his own values, he merely tries to internalise the perceptions and value systems of the cultures that he finds himself in, none of which quite match with his own needs. While evaluating Gulliver's final philosophy, it is important to bear in mind that book 4 wasn't the original ending to the book. Swift originally proposed to have the third book last. This essay is only the beginning of an attempt to situate some of the salient features of Gulliver's Travels in the context of existing texts and ideas, and to consider how the fantastical world described by Swift's maverick traveler might relate to wider concerns about the relationship between authenticity and authorship, and authenticity and truth. Cite:Jonathan Swift and 'Gulliver's Travels' by Abigail Williams, Kate O'Connor at http://writersinspire.org/content/jonathan-swift-gullivers-travels. Accessed on Thursday, April 25, 2019. If reusing this resource please attribute as follows: Jonathan Swift and 'Gulliver's Travels' at http://writersinspire.org/content/jonathan-swift-gullivers-travels by Abigail Williams, Kate O'Connor, licensed as Creative Commons BY-NC-SA (2.0 UK).